An important aspect of vehicle ownership is regular and proper maintenance. Whether the maintenance is a standard oil change or tire replacement, maintenance investments prove to be less costly and significantly safer than dealing with an unsuspected vehicle failure. The truth is that any tool, be it a car, a wheelbarrow, or a kitchen knife all need to be properly maintained for both functionality and safety purposes. Fortunately, it's a lot less expensive to maintain a knife than it is Mustang. The knife is probably the most utilized and important tool found in any kitchen, so why would anyone make something so important any more difficult to use than it needs to be? Knives serve multiple functions in the kitchen slicing, peeling, and separating; a knife excels at all these tasks when it is as sharp as possible. 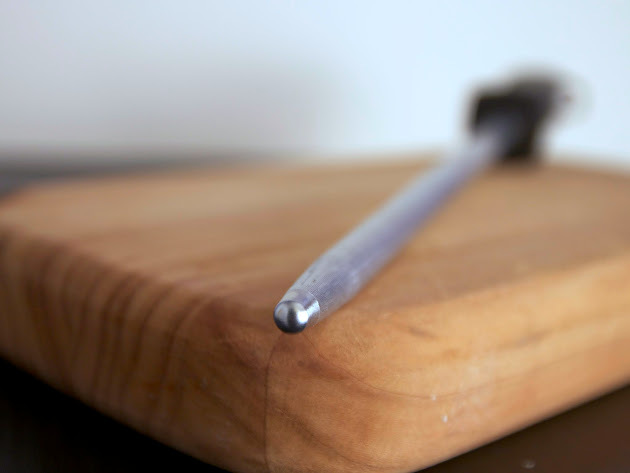 There are various techniques and pieces of equipment which help give a knife it's sharpest edge and today I will focus on one of the most practical and under-utilized pieces of equipment in the home kitchen, which is the honing steel. The honing steel is traditionally an abrasive piece of steel, although now ceramic hones exist as well as diamond coated steels, which are all harder than a knife. 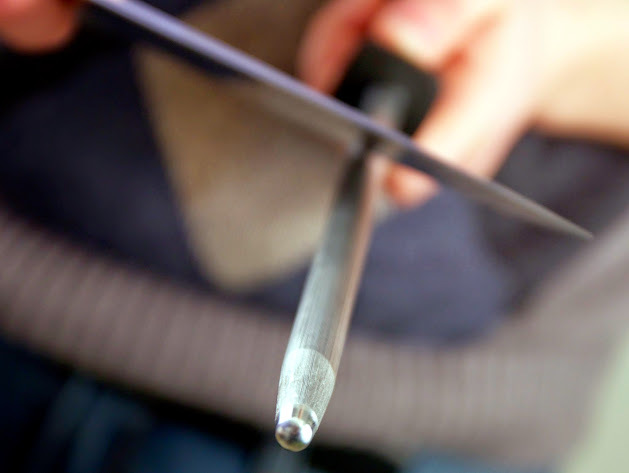 Because of the toughness of this steel when force is applied to the edge of a knife at roughly a 15 degree angle and dragged along a honing steel the toughness of the honing steel forces the microscopic bent edges of a knife realign or "straighten out". All knives edges get bent from common usage, even if the eye cannot detect this. As a knives edge becomes bent it develops a larger surface area. Using some basic principles of physics we can better understand the importance of having a sharp knife edge in the kitchen. When slicing and dicing, the cook must apply a certain amount of force from the blade onto the object which is being cut, and this force per unit area is the definition of pressure (Nave). The less surface area a knife edge maintains, the more pressure the edge will have, making it easier to cut through most items. I personally find that applying less force while cutting significantly helps with fatigue and grip related injuries. To set an example of this principle imagine a pin piercing a tomato. How can something so light, so easily pierce the tomato? Well a pinpoint has such a small surface area that it requires little force in order to exert a great amount of pressure. If one tries to pierce a tomato with something with a larger surface area like a metal coaster, they would not be able to generate enough pressure to pierce the skin. It is often said that a sharp blade is a safe blade. This may seem counter intuitive at first, but really it makes sense. Keeping a sharp blade makes the tool much more efficient. An efficient blade cuts where the user intends, as opposed to struggling to saw through an item with a dull blade. The sawing motion and inconsistency of the cut is quite dangerous for slippage. Grip loss and slippage is an extremely common factor in kitchen accidents. Finally, using an efficient and freshly honed knife is simply a pleasure. The blade becomes an extension of ones body and this greater control is thrilling. Any knife can be sharpened and honed to be a functional tool, but the weight and weight distribution behind an expensive and personal knife has an ever growing sentimental attachment. Keeping your special knife(s) as functionally efficient as possible makes working in the kitchen all the better. It is important to note that honing steels do not actually sharpen knives. As stated its purpose is to simply align the edge of a blade which in turn creates a smaller surface area. The actual sharpening of a blade is an essential part of knife maintenance as well, yet is required far less frequently than honing. I will go more in depth about sharpening knives in a later post, but for now here's a link to a decent and affordable whetstone. Nave, Carl R. Hyper Physics. Georgia State University, n.d. Web. 25 Jan. 2015. <http://hyperphysics.phy-astr.gsu.edu/hbase/hph.html>. Hey! Really well written article explaining why this matters to a layman. Thanks!